The Drive's Let's Hit 350 campaign shows its patriotic commitment Saturday as the team joins the City of Greenville to celebrate all of our Armed Forces and what they mean for our Country and our Community. 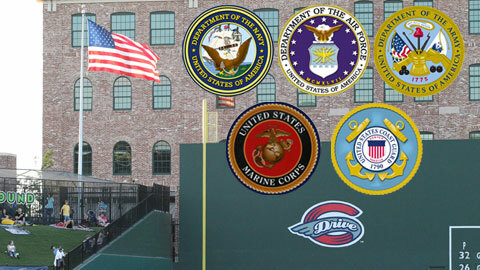 Fluor Field will host the evening portion of Greenville's Armed Forces Day celebration in conjunction with the Drive's 7 o'clock game. The Greenville Armed Forces Day Parade will begin in Downtown Greenville at 5:15 p.m. and will conclude at Fluor Field just before 6 o'clock. Following the parade, visit Field Street to check out many of the vehicles participating in the parade. During Saturday's game, visit the military tables on the concourse to learn about the history of the American forces stationed here in South Carolina. On the field, help us honor all of the troops in many fun and interesting ways as we'll see which military branch takes the cake in tug-o-war, frisbee tic-tac-toe, and other competitions! Plenty of great seats still remain for Saturday's game, and can be purchased by calling the Fluor Field Box Office at (864) 240-4528, or logging onto GreenvilleDrive.com.